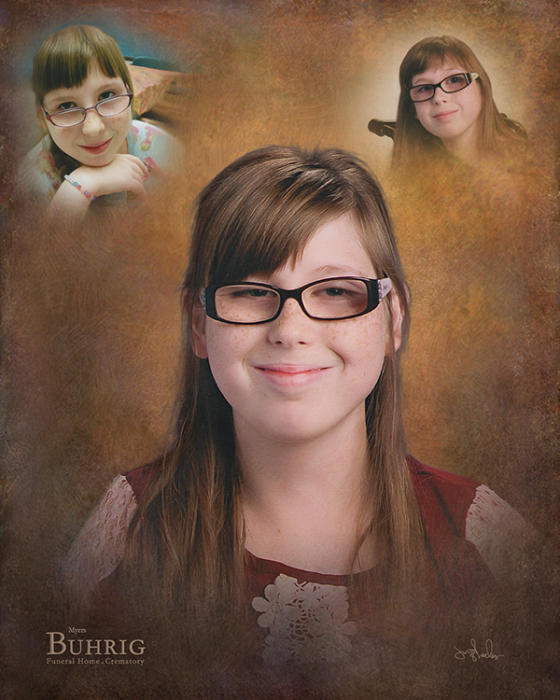 Julia Nicole Paroda, age 13, of Mechanicsburg, was born into the loving arms of her mother on Sunday, October 16, 2005 and was in the loving arms of her mother when she earned her wings and became a heavenly angel on Wednesday, November 28, 2018. Julia joyfully lived her life despite her courageous fight with the rare chronic illness that afflicted her. Julia’s survivors include her loving parents: Michelle Clayton and James “Jamie” Paroda, II both of Mechanicsburg; her two adoring brothers: Alex Clayton and Nicholas Paroda; her grandparents: Bruce and Ann Sheaffer, James Paroda and his wife, Debbie, and Cathy Clendenin; and her beloved canine companion, Lucy. Julia attended Broad Street Elementary School in Mechanicsburg and was a 7th grade student in the Life Skills Program at Mechanicsburg Middle School. She was also an honorary member of Girls on the Run. Julia loved school and thrilled in her time with her classmates, her teachers and with Carson, the service dog. Julia had an amazing enthusiasm for life and found pure joy in everyone she encountered. She loved people and enjoyed strolling around the neighborhood where she would talk to anyone who was lucky enough to meet her. Julia was caring and selfless and Nick, her youngest brother, would say that she pinched but even that seemed to draw the siblings closer to each other. They shared a beautifully strong bond that will endure. Those who knew Julia will always remember her amazing smile and joyful laugh that would light up the room as she shared her happiness with everyone. All are welcome to join Julia’s family at her gathering of family and friends on Saturday, December 8, 2018, from 1:00 p.m. until time of memorial service at 4:00 p.m. at Myers - Buhrig Funeral Home and Crematory, 37 East Main Street, Mechanicsburg, PA 17055; with Celebrant George A. Spangler officiating. Julia’s services will be a joyful celebration of her life and her love of all people. Children and adults are welcome and encouraged to attend and all will be made as comfortable as possible. There will be no viewing as cremation was private. The family sends their deepest and most heartfelt thanks to everyone in the Pediatric Intensive Care Unit at Penn State Children’s Hospital in Hershey who so lovingly cared for Julia during her illness. Julia’s family has entrusted her care to Myers – Buhrig Funeral Home and Crematory in Mechanicsburg, (717) 766-3421. Read Julia’s full obituary, view her memorial video and portrait, and sign her official guest book at Buhrig.com.